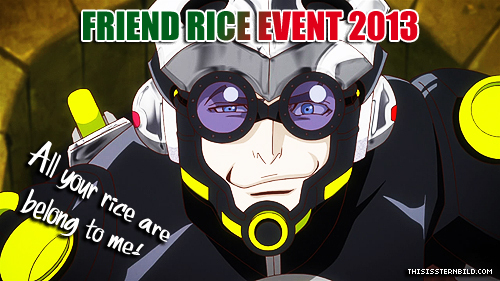 Friend Rice Event 2013 Pictures! Thank you so much everyone who took part in our fried rice (and other good Tiger & Bunny themed food) cooking event! This year we got not only a lot of tasty looking fried rice, but also some amazing cakes and displays of awesome collections of Tiger & Bunny merchandise. Let’s continue to support Tiger & Bunny in the future! And now, on to the pictures -> HERE.